The possibility of position correction with high precision and material removal of up to 0.350 mm in 18 s puts the single-machine honing of transmission gears and other components firmly in the forefront of current automotive manufacturing technology. Despite very high cutting performance, the low machining forces and temperatures enable the lowest marginal zone variances and high residual compressive strength. The surface roughness with a high material content in low cutting depth and the hone angle structure have a positive tribological effect on the sliding function of the gear. 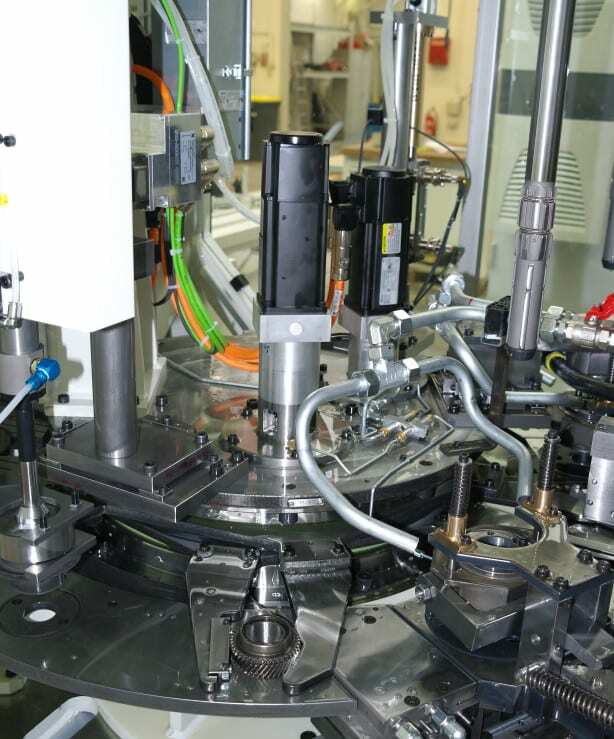 An additional innovative manufacturing strategy is the use of machines for combination machining. This fact is especially advantageous in the machining of planetary gears. Here, the process of flat finishing, ID grinding and honing are systematically combined in a single machine, as detailed in this presentation. The honing of gears, by definition, facilitates ease of operation, low noise and smoother performance in a transmission. Honing also contributes to reduced friction in the powertrain. Both the intense cutting (roughing process) as well as the functionally fine finishing of transmission gears can be performed in one setup, on one machine. Honing in mass production is a well-established process, owing to the intelligent machine layout and other combinations with defined cutting geometries. It should be technologically and economically considered as a serious production method. Furthermore, the combined process of flat surfacing and honing on one machine is a further recent innovation for the finish machining of planetary gears in mass production. The design of components for modern vehicle transmissions such as manual, automatic or dual clutch styles seeks to reduce friction, thereby increasing gear efficiency in addition to function. Therefore, for the gear bores of various active transmission components and planetary gears, there is the requirement for low-friction and wear-resistant contact topographies. Also, there is the desire for economical finish machining of the bore in one process, whenever possible. The finish machining of transmission components in mass production is currently being done using rough honing and finish honing. In one process, consisting of two steps on one machine, the functionally accurate shape and position tolerances, as well as the desired surface structure, can be achieved. Therefore, secondary hard turning and grinding processes are seldom required as finish processes in mass production, neither individually nor as combined processes in a work cell. The diverse quality characteristics require an adjustment to individual process components of honing. The manufacturing quality of the conventional hone process is defined by the terms “dimensional tolerance” and “surface finish.” Furthermore, for the function of gear wheels, the quality terms “axial run-out” and respectively, “perpendicularity” and “radial run-out” (out of round) are relevant. If one also wants to use honing for the finishing of gear wheels, the process of these broadened quality terms is modified accordingly. The bore in a transmission component functions as a rotary and translational slideway. The tolerances are selected accordingly. The honed topography with high material mass benefits the frictional behavior and homogenizes the application of force. The honed surface profile with a large topographical contact surface enables a stabilization of the lubricating film, when mixed friction occurs. The loaded contact surfaces have a high adhesion for the gear oil, which prevents a breakdown of the lubricating film on the contact surfaces. This acts to reduce friction and minimize wear in the switched condition with high system pressure on the contact surfaces as well as the unloaded rotating idler. Also, the hone angles contribute to the even distribution of the lubricating oil in the lengthwise and circumferential direction of the bore. In order to avoid local high surface pressures, there are also tight shape and position tolerances of the required macro-geometrical conditions for equal lubrication gap widths. The tight geometrical tolerances (axial run-out) and radial run-out have a positive effect on the smooth operation of the gear wheel sets. This is the purpose of the statistical tolerance limits. At a machine capacity of cmk  1.33, for example, the straightness is reduced from 3 µm to about 2.1 µm, despite very different wall thicknesses. In addition to the geometric tolerances, highly stressed components are increasingly evaluated according to the marginal zone of the functional surface. The mechanical and thermal stress of the material due to the machining forces during the final machining steps contributes to the microstructure in the area near the surface. Here, there are significant differences between the process used and the finishing operation. The honing process is one operation with comparatively low machining forces and temperatures. The conditions for developing a lasting, highly durable marginal zone are therefore especially advantageous with honing. Therefore, hardened parts are also the subject of material testing in terms of compressive stresses that positively influence the fatigue strength of highly stressed bore surfaces . 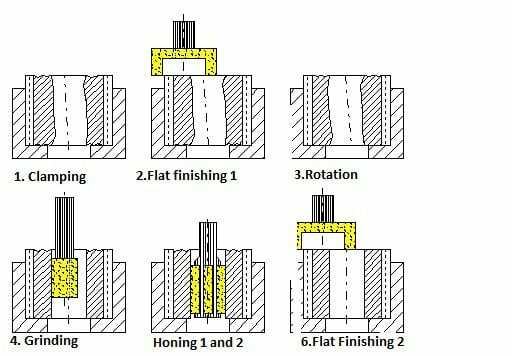 An important feature of honing is the alignment of the tool axis and bore axis. In the conventional layout of tool and part, the expansion of the tool results in an equiaxial alignment. The tool-part system has designated degrees of motion freedom which enables the centering and tipping up to identical axis position. An improvement in dimension, shape and surface quality is achievable with this mechanical system. If the position of the bore needs to be corrected, that is, the perpendicularity of the bore axis to the front face or the axial runout of the front face to the bore axis, the angular degree of freedom (tilting) must be replaced by a rigid perpendicular positioning of the tool axis and clamping surface . The reference surface for honing is the machined front face, which is supported on the clamping level (Dia. 1). Centering on an inaccurate gear tip circle diameter is not necessary. As a result, the center of the gear wheel bore can align itself to the tool via the floating part holder. Due to this condition, the radial run-out (bore to gear teeth) remains unchanged. The deviation of the angle position of the bore axis to the tool axis is corrected in the subsequent material removal. Next, the tool machines the raised areas of the lateral surface. With the additional clamping, the entire bore is machined and a new bore axis is established. The common principle among the various possibilities for gear wheel machining is the moveable part holder and the rigid tool holder. Also, the conventional honing process with adjustable honing stones has been carried through. For honing such components, vertical rotary indexing machines with the single part holder in floating fixtures are used (Tab. 2). The preparation consists, as a rule, of boring and hardening, so that they must be machined in two honing operations. The tools are exclusively loaded with CBN-abrasives. Furthermore, fully automated production honing machines are equipped with various standard components such as gage stations, handling systems, force-controlled electromechanical feed devices (EMZ-F) and electromechanical ballscrew stroke drives. 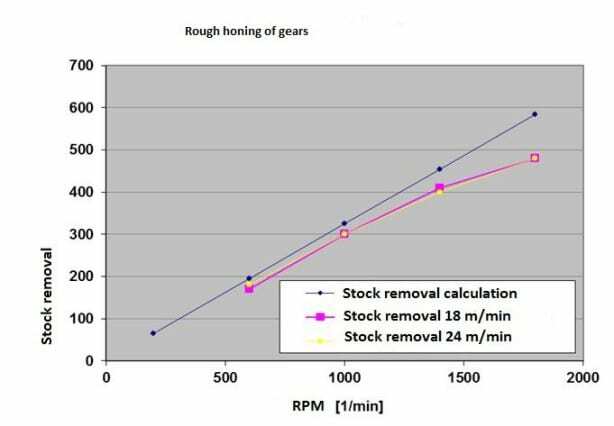 The high stock removal during rough honing with a honing allowance of up to 0.350 mm is the prerequisite for the successful implementation of the honing process in the mass production of gear wheels. This is how honing maintains its competitiveness compared to hard turning. The smoothing of the surface end quality takes place in the 2nd machining station only by changing the cutting material and adjusting the process parameter. The radial run-out achieved in pre-machining should remain unchanged. The layout of a machine for machining gear wheels shows the stations named in Table 2. After the load and unload station, the mechanical pre-gaging is performed. Here, the minimum dimension of the bore is checked, in order to prevent a collision with the tool. Rough honing works with robust parameters, especially with high cutting speed of about 150 m/min and large removal rates of about 20-30 µm/s in diameter. The subsequent finish honing operation completely removes the rough profile of the rough honing operation and leaves behind the functional component quality (Dia. 2). Pneumatic post-gaging is the final quality assurance; spinning the gear minimizes the spreading of the honing oil. The machining parameters are summarized in the following table (Tab. 4). The high removal rate is primarily determined by the high delivery rate and high cutting speed. With increasing rpm, a rise in material removal is clearly noticeable (Dia. 3). The mathematical removal characteristic is determined by the feedrate, i.e., by the diametric preset diametrical honing stone feed per unit of time. The difference between calculated and measured stock removal results from feed losses caused by deflecting the components in the complete feeding system. The increasing deviation from about 1500 rpm is explained by an increase in coolant flow at increased rpm. The influence of the stroke speed in the area examined in not significant. Because of the material properties and the high cutting capacity, the rough honing operation produces less fine-grained hone sludge. Instead, fine, long continuous chips in the form of a steel wool ball result. The function of CBN-abrasives of a middle concentration (stock removal  0.300 mm in 18 s) is decisive for the entire process. The use of low viscosity honing oil ( = 4.6 mm²/s) has a positive effect on the cutting behavior and, thereby, on the consistent manufacturing quality and tool life. In addition to the constructive design of the hone tools, the condition of the abrasives is of vital importance. They are composed of a metallic binder, fused with the proper concentration of CBN-abrasive crystals (Dia. 4). Apart from the selection of binder and grain material, the sinter parameters in the manufacturing process of honing abrasives determine the quality. The hone tools are rigidly connected to the spindle. Below the part, the tool body is formed as a carbide reinforced guide shaft. The tools, depending on design feasibility, have as many abrasives as possible. This improves the machining accuracy with regard to dimensional stability and increases cutting performance and tool life. The individual processing with conventional abrasive tools is the most economical variation of gear honing. The stationary fixtures are arranged under the two hone spindles. With the rotary index movement, the gears are loaded into the fixture. The fixture consists of the floating part holder and the zero-clearance hold-down device (Dia. 5). The part is situated on one of the flat sides of a moveable pallet. The hydrostatic friction bearing of these pallets enables effortless but not undamped movement on the flat. A torque recorder in the gear teeth has been proven effective. This occurs by means of the insertion of the gear into an integrated switch sliding sleeve or by applying a safety catch. The zero-clearance hold-down to accept the upper facing axial force helps with the deformation-free fixation of the gear. The lower guide stabilizes the tool axis to the clamping level at a right angle. The described process design can reliably achieve the required tolerances. The roughness and the axial run-out are not statistically evaluated here. With the finish hone stones (B46), the Rz-value amounts to about 1.5 – 2.5 µm and the axial run-out precision of 15 to 25 µm only meets about 40% to 50% of the tolerance. The cycle time achieved is 20 s with an allowance of  0.300 mm in the 1st operation (determined by cycle time). The quality parameters of diameter, roundness and parallelism are also calculated to meet tolerances and satisfy the statistical tolerance limits. Measuring the compressive stress with the help of x-ray diffraction shows the condition of the material structure in the area of the marginal zone of the honed bore surface. The compressive and tensile stresses in the sub-surface are depicted. The stress in the area of the functional surface is substantially influenced by the hardening process and the stress of the finishing operation. The penetrating x-rays are reflected in the relaxed marginal zone according to the particular grid pattern of a material at a constant angle. Tensile or compressive stresses, however, imply deviations in the grid pattern from the normal value for the relaxed state, caused by the machining forces of the finish operation. They are verified by changing the reflection angle. In terms of fatigue strength, the highest possible compressive stress (-) is always advantageous . The available measurements (Dia. 6) were taken with a Stresstech XSTRESS 3000 instrument. The values were measured axially and tangentially. The hone angle of about 20° causes an uneven distribution of the compressive stresses in both directions on the honed surface. 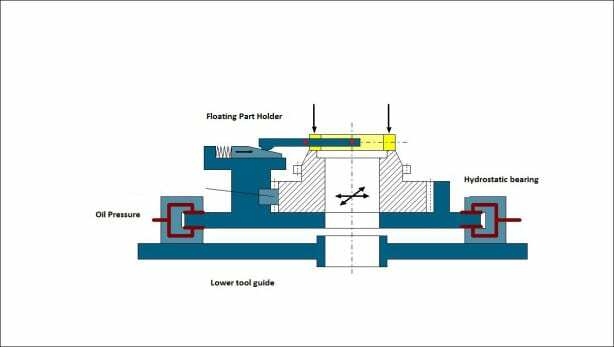 With increasing material depths, that is, with diminishing influence of the machining forces, a broad homogenization of the clamping is measurable. The achieved results indicate the advantage of the honing process. They clearly exceed the values of competitive processes such as hard turning  or grinding. 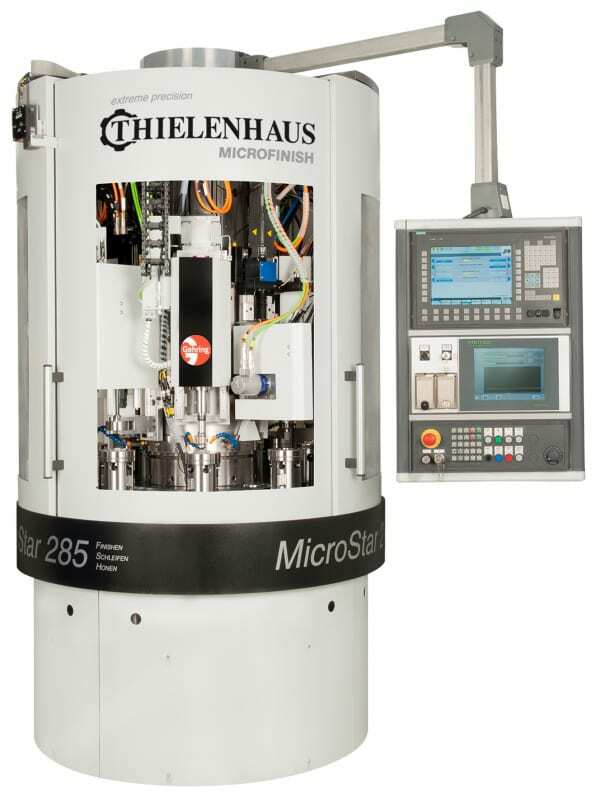 The combination machine with the processes of flat finishing, grinding and honing offer a new possibility for machining planetary gears, as shown here. This rotary indexing machine completes the processes on the part, one after another in one clamping. This allows various machining geometries, such as one bore and one face surface to be machined, each with tight tolerances relative to the other. The compact machine workspace essentially consists of a circular rotary table, on which the rotary driven units are constructed and the central column, where the machining units are assembled to the upright surfaces. The result is a self-sufficient machine with a small footprint and short transport route in the indexing of the part. The circular rotary tables make the machining units easily accessible for maintenance work and tool changes. Dia. 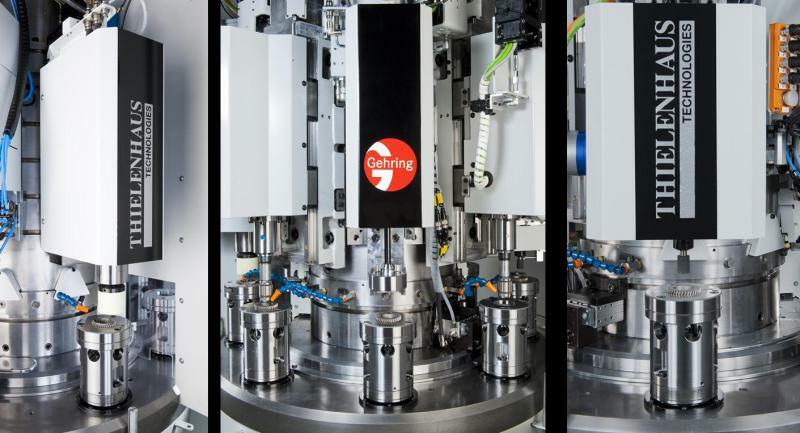 7 depicts the process steps for such combination machining. The part is only pre-machined on the front and in the bore. The gear wheel is located in the fixture with an unfinished side up and is clamped radially on the gear teeth. The tip diameter or the involute teeth are the geometric identifying elements for the position of the part. The upper front is machined by flat finishing 1. Then, the part is turned, so that the previously finish-machined end surface fits in the fixture as the locating surface. In the subsequent grinding operation, the bore is ID ground centric to the gear teeth. With this, the desired radial run-out tolerance is achieved. This enables the subsequent station to work with a tightly clamped hone tool because the alignment is made to the unchanged clamping fixture and guarantees the centric ground bore. Therefore, a new bore axis will not be partially processed. The hone process consists of a rough hone and finish hone operation. Between the two hone operations is a gage station, in which a plug gage records the rough hone diameter using the principle of pneumatic length measurement. After finish honing, the flat finishing 2 takes place. Here, the second end face is machined parallel to the first end face. Diagram 8 shows the individual machining stations, with the flat finish machining directly after the load and unload station in the left-hand photo. In the right-hand photo, the grinding spindle directly before plunging in the part is depicted. 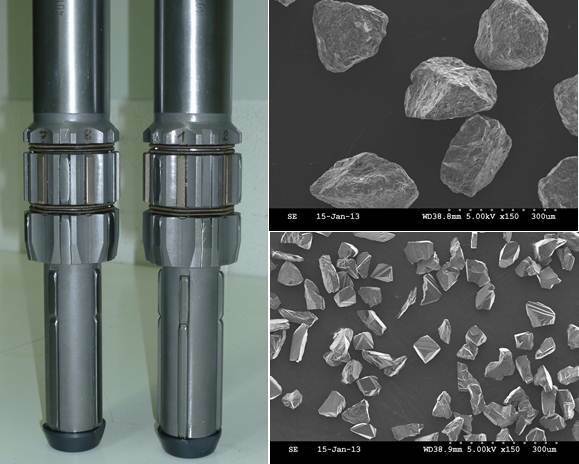 The middle photo shows the honing stations arranged after grinding, as well as the gage station for measuring the diameter after honing. All stations together work the rotary driven part. This is especially unusual in a hone process, but allows a significantly simplified spindle set-up. The hone tool only performs a feeding movement and a stroke movement. The machine concept is designed such that other process sequences are configurable. There is also the opportunity to integrate modified modular units such as deburring, wheel dressers, belt finishing or reaming. The concept of combined machining is especially useful in the manufacturing of planetary gears. Previously, the manufacturing processes for flat finishing, ID grinding and honing required different machines. The consolidation of the processes into one machine allows high capital investment savings, increased productivity and reduced operational footprint. (Dia. 9). For planetary gears, cycle times of 7 s with material removal in the bore of ≤ 0.15 mm are achieved. Dipl.-Ing. (FH) Gerhard Flores is Manager of Process Development at Gehring Technologies GmbH in Ostfildern, Germany and a lecturer at the technical university in Esslingen, Germany. His associate, Dr.-Ing. Andreas Wiens, is Team Leader of Process Development for Gehring Technologies GmbH in Ostfildern, Germany. Dipl.-Ing. Oliver Stammen is Sales Manager for Thielenhaus Technologies GmbH in Wuppertal, Germany. B.A. Shaw, J.T. Evans, A.S. Wojtas and L. Suominen: “Grinding Process Control Using the Magnetic Barkhausen Noise Method.” Third International Workshop on Electromagnetic Non-Destructive Evaluation. Reggio Calabria, Italy, 14. – 16. September 1997. IOS Press in the Series ‘Studies in Applied Electromagnetics and Mechanics’.